Origin: Welfenkönig II was licensed in Verden in 2005 and went on to obsolve the 11 month performance testing in 2006 with Celle’s group of young stallions (a tremendous honor for a privately owned stallion). He was 4th overall (125.80), 3rd in the dressage (125.04), and 11th in the jumping portion (114.58). He received 8’s almost across the board with particular mention to his excellent rideablity, temperament and gaits. In addition he received a 9 for his ability on the cross country course. This was the second highest cross country score only to be superseded by Comte(Contrendro/Granulit/Landadel). Welfenkönig II’s pedigree combines a very successful and well established breeding niche famous for producing high rideablity and extraordinarily good temperaments. Sire Wolkenstein II represents Weltmeyer as one of his most influential sons. 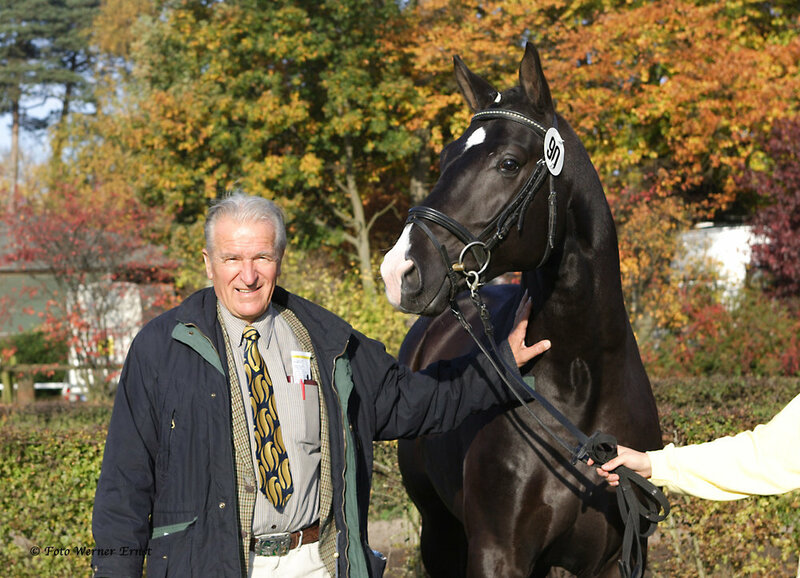 He was vice-champion of his licensing, performance test winner, and 1993 Federal German Horse Riding Champion. He has sired over 40 licensed sons and 60 State Premium daughters. Wolkenstein II’s dam, Wolke, has equally impressive accolades and carries the mother lines of Garibaldi I & II and Brentano I & II. 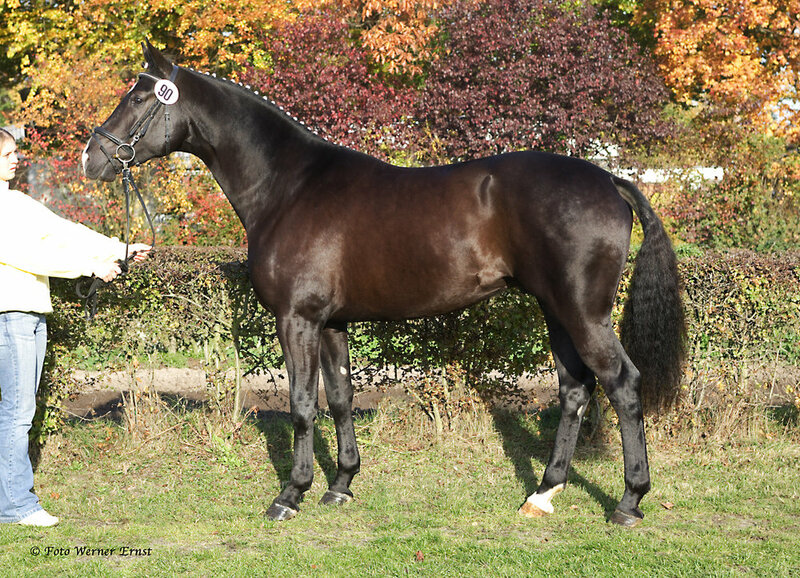 Dam SPS Moonlight, by Matcho AA was an excellent producer for breeder Guenter Spiewak. She produced 5 offspring by Wolkenstein II; 2 licensed stallions, 2 Elite mares and, and 1 son that sold at the 2003 Verden Elite Auction. Welfenkönig I was licensed in 2003 and stood at the State Stud Celle until he was sold to the State Stud of Saumur, France. An interesting note…..The riding school in Saumur recently permitted the attendance of women of which Welfenkönig I was ridden and campaigned. A true testament to the rideablity and character of this pedigree. Wonderland I, a full sister to Welfenkönig , has also been very successful. She was awarded her EMC after winning her inspection and performance test (7.88) at the 2007 AHS inspection in Conyers, Ga. She also had multiple wins at Devon from 2004-06 including the Hanoverian class and a suitability class. Option #1 $1,400 (includes $250 booking fee) LFG. Discounts to Elite, SPS,or performance accredited mares. Option #2 $500 A-la-carte ONE YEAR breeding fee. No LFG or collection fees included. Discounts do not apply.